PPC is the global leader in drop connector design, manufacture, quality and support. 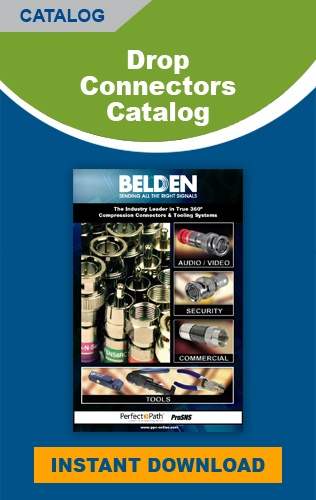 PPC is always at the forefront of connector innovation developing products that provide real and measurable positive impact to your network performance and reliability. This same level of quality and performance is provided in various pre-made bulk field coax jumpers and installation kits. PPC ProSNS RG6 Compression Connectors are designed for the Commercial and Residential Audio/Video and Security markets. 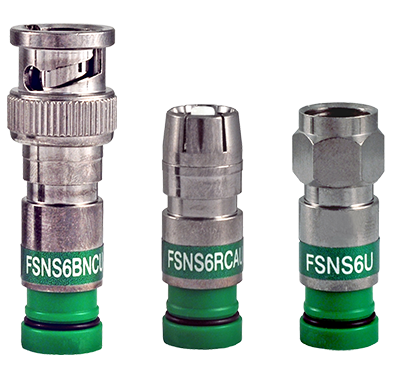 Using the ProSNS™ line of compression connectors will make installation a “snap”, thanks to the low compression force associated with the ProSNS™ line of compression connectors. Patented floating-pin basket is incorporated into the design of the ProSNS™ connector. By positioning the pin basket at the back end of the connector, the insertion of the cable center conductor is easier and more accurate.